Some 350 children separated from their migrant parents this summer have yet to be reunified, despite a court-ordered July 26 deadline to do it and endless hours of pro bono legal aid. About half of those kids are on track for reunification. BROWNSVILLE — It took four months of detention, a $13,000 bond, pressure from a U.S. congressman’s office and a network of attorneys to finally reunite Angela with her 16-year-old daughter on Friday. The Central American mother and child were separated at the border in May under the Trump administration's since-overturned “zero tolerance” policy. 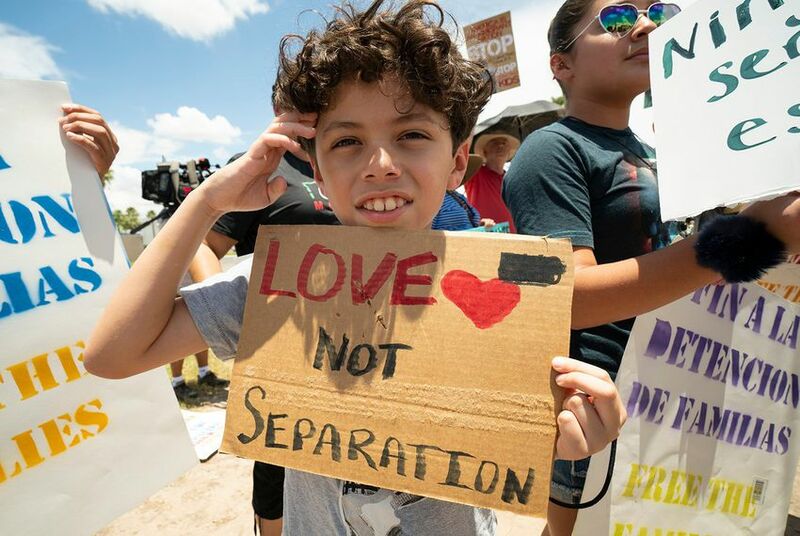 Some 350 children separated from their migrant parents this summer still have yet to be reunified, despite a court-ordered July 26 deadline to do it and endless hours of pro bono legal aid. About half of those kids are on track for reunification. “The government has been dragging its feet and fighting tooth and nail at every point since,” Angela's attorney, Laura Peña, said of the missed deadline. Federal officials declined to comment for this story. But in a Sept. 27 report, they said they're trying to "identify any possible barriers to [the children's] discharge" and are working with the American Civil Liberties Union to find solutions to reunite families. The kids who remain in federal custody — a fraction of the 2,654 who were separated from their families this summer — fall into two categories. In the case of 141 children, parents waived their rights to reunification or indicated they did not immediately intend to reunite with their kids — likely because they reasoned their children would have a better chance at an asylum claim if they stayed in the United States. There are another 29 cases where the U.S. Department of Homeland Security found parents unfit for reunification, arguing there were "red flags" — anything from criminal histories to abuse allegations to pending DNA results. Those combined 170 children will remain in shelters indefinitely. Meanwhile, 136 other children simply haven't been reunited yet; the ACLU is working to locate and identify parents both inside and outside of the country for reunification or to find another appropriate person to release the child to. Advocates and attorneys for these families say they are completely overwhelmed, stuck cleaning up a massive, government-sponsored mess that has fallen squarely in their laps since the ACLU sued to force the reunifications. Lawyers for the ACLU and other nonprofit groups have taken up much of the responsibility of finding parents who were already deported, though they've emphasized in court documents that the government should bear that responsibility because “it was the government’s unconstitutional separation practice that led to this crisis.” Meanwhile, a new report released Tuesday concluded Homeland Security was never prepared for "zero tolerance" to begin with. Before crossing the border into the United States with her daughter, Angela, whose lawyers declined to release her full name and nationality to protect her safety, had fled forced prostitution in her home country. After Angela was separated from her child, it took three months for Peña, who works with the Austin legal advocacy nonprofit Texas Civil Rights Project, to hear about and pick up the case. It was another six weeks before U.S. Rep. Filemon Vela, D-Brownsville, joined the effort to get Angela’s daughter released from a South Texas shelter. RAICES, another nonprofit that provides legal aid to immigrants, paid Angela's bond so she could be released from immigration detention while her asylum case makes its way through the courts. More reunifications like Angela’s should happen in the coming weeks, immigration attorneys predict. The Sept. 27 federal report said the government is currently working to discharge 34 children to their parents or to sponsors in the U.S. Another 27 children are expected to be reunified in their country of origin. But it could be months before kids whose parents were deported or waived their rights to reunification get moved out of federal custody. For the deported parents, immigration attorneys are working with the ACLU and local humanitarian aid agencies like Justice in Motion to locate family members in their home countries. It’s a time-consuming, arduous process given that many of the families live in isolated, mountainous or rural Central American communities. For the "red flag" and waived reunification rights cases, children can be released to outside sponsors, usually another family member. But even that’s become complicated. Potential sponsors must undergo suitability assessments that leave them vulnerable to deportation if they’re undocumented themselves. In September, 41 people were deported after going through background checks and fingerprinting in the sponsorship process, making it less likely that relatives will come forward and claim separated kids. Meanwhile, shelters are growing to accommodate the number of unaccompanied migrant children, some of them holdovers from this summer's "zero tolerance" separations. A federal care shelter in Tornillo recently expanded to hold 3,800 children. The average length of stay in these shelters has also increased in the last year, from 34 days to 59 days. For the remaining kids separated under "zero tolerance," it's a waiting game. Without the same level of national attention they got this summer or a new court-ordered deadline to spur government urgency, this last piece of the family separation crisis remains the most difficult to resolve. Editor's note: The Texas Tribune and TIME have partnered to closely track the family separation crisis at the U.S.-Mexico border. This story is not available for republishing by a national news organization until Oct. 5 at 6 a.m. Texas news organizations may run it at any time. For more information email nchoate@texastribune.org.